Character List for Dark Age of Piracy, a “no contact” live-action roleplaying game. Below are characters who you can play as during this game that is set approximately in 1724; most are real historical personages or are based on amalgamations. For purposes of the game, some history is changed,* but most is true. We effectively operate in “Movie Time” for purposes of this game. The age beside an individual’s actual birth/death dates is their effective age for purposes of the game. *For female 18th century clothing, https://www.pinterest.com/lucindabrant/18th-century-artladies/ has some inspiration. 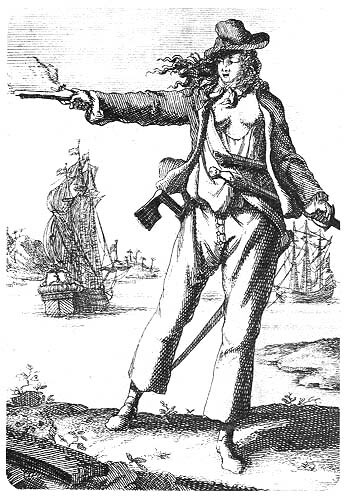 Also, http://upload.wikimedia.org/wikipedia/commons/b/be/Bonney,_Anne_%281697-1720%29.jpg (An “artistic” conception of Anne Bonny). The Governor’s daughter, whose support is desired by many. She has been well trained in politics and the sword. You, one of the few female pirates, sailed with Calico Jack as his First Mate. You appreciate bawdy humor and are forceful and bold. You have a competitive personality and a bit of a gambling problem. If there’s a bet, you’re probably ante-ing in. Scourge of the seas, seven foot tall with a mess of an ebony beard-The quintessential pirate’s pirate about whom sagas are sung. Never leave a ship anything but outraged, looted, or sunk is your creed. You are hotheaded, bold, and the best navigator. You were a surgeon, wronged in love and then accused of a crime. You earned the enmity of Britain when you joined a mutiny against the ship’s captain—Bligh, after he ordered a man whipped to death at the masthead for a minor transgression. In the mutiny’s wake, you treated the sailors’ wounds. The new Captain took a liking to you and taught you sea charts. You rose through the ranks, stepping into his shoes by election after he perished in a fight for a Spanish Galleon. Your ship was seized by Tortuga’s Governor on docking for inability to pay. You are effete to the point of silliness, which you acknowledge with good humour. And you are obsessed with superstition. You, a dashing swashbuckler of a pirate, sailed as William Kidd’s quartermaster. You have a good head for numbers and are one of the shrewdest pirates here. When pirates landed on the island, they killed your husband-a mid-level bureaucrat and Lord, and set up a reign of terror. You used your fencing knowledge and their chauvinism against them, challenged two pirates to a duel for control of their crews, killed them and assumed leadership. A meticulous planner; Graybeard is the ice to Blackbeard’s passion. He sailed here eager to play the game of politics. Gullah Jack, a resurrection man of great power, came here on Black Bart’s ship as his Quartermaster. On this Island, his powers are greatly amplified. You oversaw work on your sugar plantation and lived as a Gentleman in the Carolinas, but that was boring. You read a great deal of romances and followed the latest news, so you decided to become a Pirate! You commissioned an excellent ship, the “Revenge”, then embarked on piracy. You joined up with your hero Blackbeard… who proved to not be as welcoming as you would have expected… He seized your ship. Your ship is yours by right of election; your crew elected you. Then you marooned them after they drank up your special reserve of ship whiskey. You barely managed to land here at Tortuga with only a First Mate (Molly Mae), who you promptly fired. You need another before you can set sail again. You made your name hunting Spanish privateers and stealing Galleons. The only Captain who evaded you was Laurens deGraaf, captain of the Marie Celeste, which, if rumors are to be believed, has become a ghost ship. You are flamboyant and harsh when crossed. You once sailed against the French, and your exploits became legendary. You also once hunted Pirates, though those days are behind you. You value Britain highly; you regularly attend Protestant religious services, and you are a gentleman toward others. Your word is your bond. The white Whale sank your first whaling ship, the Pequod and took your leg– you walk on a whalebone prosthesis—so you want revenge. You have tracked the dread Whale to the south. You will do whatever necessary to ensure that the whale menace is destroyed. You terrorized the sea as a Captain after the previous one took a cannonball to the knee and you were elected in his stead-first as a joke. But you demonstrated your competence. Matters soured, though, and to escape capture, you faked your death and pretended to be a man. The most recent crew, on discovering you were a woman, let you off at Tortuga and you’ve again thrown off your disguise. Some call you “Back from the Dead Red”, in reference to your last name and hair. You’re used to playing a duplicitous role. After your older half-brother’s death, your mother dressed you as a boy so the family would continue to receive support from your paternal grandmother. You are high-strung and combative. Your da’s an owner of merchant ships who taught you the trade but who wouldn’t let you experience it. Not wanting to settle for marriage, you took to the seas to learn. You gambled and won a great deal, then lost a great sum. So, you stole a Ship Officer’s coat and identification and passed yourself off as a male First Mate. After you got enough respect, you let the Men know your true nature. You sailed to this dread port of Tortuga with Captain Morgan, serving as his spiritual advisor after your capture on a Spanish vessel. You stayed with him when your fellows were ransomed. You are inexorable and adamant. You sailed under Melville Ahab as a whaler for years, and with your savings, you purchased some land in the Carolinas. Later, you joined him in his mad task, hunting the White Whale, and sailed south to Tortuga. You learned the healing arts and sailed with your English husband-doctor until he died in a cannon-blast before Dutch pirates boarded, led by the Griffin, Laurens Cornelius de Graaf. De Graaf pledged safe passage to you and your son. Angered, you challenged him to a duel. He drew his sword; you pulled a gun. He laughed, and proposed marriage. You shot him in the heart, or you would have, had he not been carrying a Bible that absorbed the bullet. He gave you time to think over his offers. Shut up in a room with your nursing son, you read books provided- strange pieces Laurens recovered from looted ships, bearing Spanish, Latin, English, Aztec, and Olmec literature. When the Olmec tablet shattered as a result of your son’s pawing about, you cut yourself and triggered an ancient protective spell. Ever since, you’ve had special insight. Since then, you have been a resource for pirates, who come to you for fortunes and advice. Black Bart, your former captain and an avaricious man, marooned you. But, you made your way off the island, sailing on a turtle’s back, at least you so claim, and you’ve been claiming that so long you believe it. All hasn’t been too bad on the island though. You’ve made friends, but you’d like to sail again! You are optimistic and excitable.